Citizens from the European Union with an interest in working in Germany are able to do so as an automatic right. The same applies to citizens of Liechtenstein, Iceland, Norway and Switzerland. People from Bulgaria, Croatia or Romania are likely to require special work permits. Specific detail can be sourced by contacting ZAV (International Placement Service) or BA (the Federal Employment Agency). Candidates from outside the European Union that do not hold a University degree are unlikely to be able to source employment in the country. Candidates that hold a local University degree and are interested in working in Germany have 18 months to source employment that suits their qualifications. This is where Skills Provision outshines competitors. Our Placement Department are successfully sourcing quality positions into the German corporate arena, on a regular basis. Workers with suitable recognised international qualifications are entitled to a six-month Visa; this allows time to source suitable employment. The condition of the Visa is based around a person being self-supportive. Please note this Visa entitles a candidate to search for a job it does not give permission to work. If a degree is obtained from outside the country it needs to be issued by a recognised University. 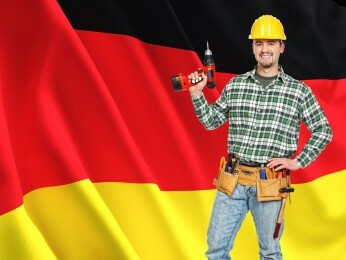 Those interested in working in Germany will need to make sure their qualifications match up. An employer will not make a formal offer without the reassurance of all documentation being in order. They may also request skills recognition proof on trade related issues. Once a candidate receives a job offer, they are entitled to an “EU Blue Card”, This document is a combination of a residence and work permit. It will be provided as long as the annual gross salary is in line with the minimum threshold. If a salary is below the threshold, a person can still work can work as a doctor or in one of the “MINT” sectors (mathematics, IT, natural sciences, technology/engineering). Generally speaking employers only turn to workers from outside the European Union when all other avenues have been exhausted. That said Skills Provisions relationship with German companies is a strong one. It’s for this reason we have a high placement percentage. Certain professions are regulated and skills recognition is mandatory. With other professions it is optional. We strongly recommend all potential candidates seek skills recognition early in the process; this will avoid delays when employers exhibit an interest. To candidates we send a strong message, preparation is the key to success, this and taking time to produce a quality CV. For those interested in working in Germany we suggest you register on our website and upload your CV at the earliest opportunity.